When it comes to saving money, nothing beats buying directly from the source. With material goods, this usually means you have to buy a large volume of items at a "wholesale" price. With food, however, there are several ways you can buy directly from the farm without having to order crates of eggs or 20 pounds of beef. The obvious way to do this is through farmer's markets. I grew up in a Pennsylvania town surrounded by farms, where there were tons of roadside produce markets offering up fresh sweet corn, juicy tomatoes, peaches, melons, and all other kinds of delicious summer veggies and fruits. When I lived in Los Angeles, I frequented weekend farmer's markets that went on for blocks and were every bit as much as "scene" as the nightclubs (once I saw Marilyn Manson there!). 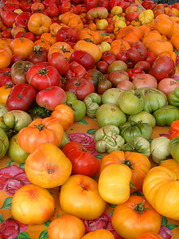 Unfortunately, here in Arizona the farmer's market fare is a little lackluster, seeing as how it's the desert and all. But I've found some other ways to buy farm-fresh foods at a low cost with minimal inconvenience. CSAs are Community Supported Agriculture groups. Basically, you pay a monthly or weekly fee to a local farm, and then pick up a basket of produce from said farm on a monthly or weekly basis. There are several great things about joining a CSA. 1) You are supporting a local farm; 2) You are guaranteed fresh, seasonal produce; 3) You are exposed to new foods you might not necessarily have purchased yourself. The only con is that you can't control what you get. It's possible you'll end up with a huge bag of beets and kale; so if you hate beets and kale, you're kind of screwed. But most CSA farms will provide you with a list of the veggies & fruits they grow, so you won't be completely shocked by what you end up with. If you're interested in joining a CSA, or just want some more info, you can look up the participating farms in your area at this website: www.localharvest.org. If you have the fortune of living in Arizona, Idaho, Utah or Washington, you may have a "Bountiful Baskets" co-op in your area. This is a group of volunteers who buys directly from the same suppliers that service grocery stores and restaurants and then pass the savings along to the participants. Much like a CSA, you pay a weekly fee and then go pick up your "surprise" basket each Saturday. You can do it as often or as rarely as you like, so there's no ongoing commitment. Also, you can choose between conventional or organic produce. ALL of that for $30!! I was really amazed and excited. Aside from the fact that I scored a great deal on all that produce, I felt inspired by some of the unusual foods I got. I've already tried two experimental dishes - one a success, the other a failure. I will post the recipe for my success (pork chile verde) soon, along with my other experiments. I am challenging myself to use everything in the basket before it goes bad, so I'm sure it will result in some interesting meals. That's an awesome amount of produce!! Just found your blog. Look forward to checking in regularly. I personally saw the basket of produce and was so impressed (especially at getting up at 6:30 on a Saturday morning to get it). This seems like an awful lot of work. I'll just abstain from buying produce. Buy a dehydrator & dry it if you're not gonna use it all fast enough. I've been doing that for over a year now, and it's AMAZING!!! I am impressed and hungry after this post!! thanks for sharing!